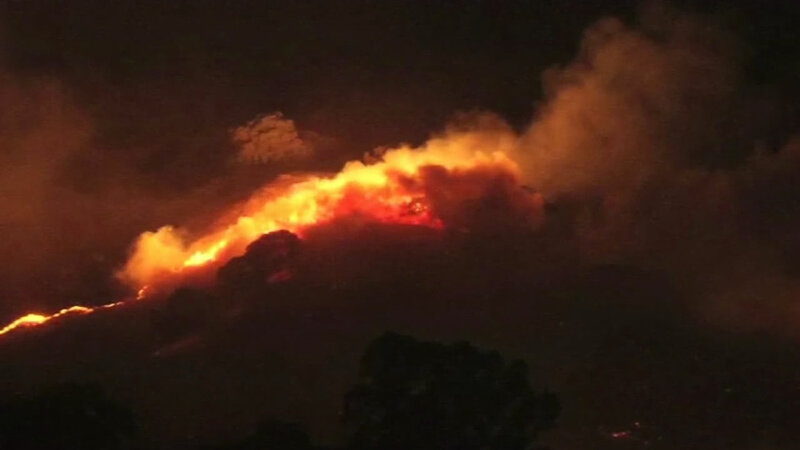 VACAVILLE, Calif. (KGO) -- A 4-alarm brush fire burning near Keating Park and Pena Adobe Regional Park in Vacaville prompted the evacuation of approximately 100 nearby home Saturday night. Fire crews are now mopping up and will remain on the scene to assure that no flare ups occur. All voluntary evacuations have been lifted and roads have reopened, while Lagoon Valley and Pena Adobe parks are closed. An evacuation center was established at Three Oaks Community Center on Alamo Drive and police said about 125 people sought shelter there. Residents in the area said thick smoke made it difficult to breathe. Early Sunday morning, the City of Vacaville issued a statement saying the fire was first reported at 9:32 p.m. and began as a 5-10 acre fire. With winds at 30 mph and gusting to over 40 mph, the fire quickly spread as flying embers caused other fires. Cal Fire and strike teams from Contra Costa and Yolo counties assisted Vacaville city fire crews in fighting the fire. There were 20 fire trucks, three bulldozers and over 130 firefighters battling the blaze. The official statement went on to say, "At one point, many streets were closed and neighborhoods were under a voluntary evacuation order. Neighborhood areas closed included Skyview Place, Ariquipa, El Matador Mobile Home Park, Hidden Oaks, Terrace Court, Los Robles, Black Oak Court, Red Oak Court, Atherton Court, Selby Court, and Menlo Court. Streets along California Drive were also closed." On Sunday, Lagoon Valley Park will be closed to the public while fire crews put out hot spots and investigators try to determine the exact cause of the fire.